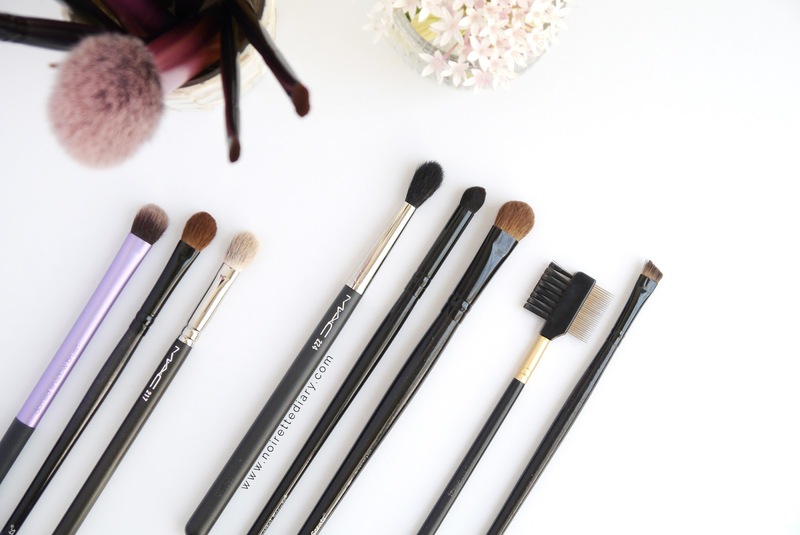 It was a very long time ago when I upgraded to makeup brushes instead of using my fingers and sponge applicators from my eyeshadows palettes. Over time I have accumulated several favorites, some of them new and some old-time staples for me. Here's the list. Fue hace mucho tiempo cuando me reformé a usar brochas para maquillarme en vez de mis dedos o los aplicadores de esponja que venían en mis paletas de sombras. Con el tiempo he acumulado varios favoritos, unos de ellos nuevos y otros que han sido de a grapa desde el inicio. Aquí está la lista. Just a quick note, the first makeup brushes that I decided to invest in was the 22-piece Coastal Scents Brush Set. The quality in these is beyond amazing and they have lasted ages for me. I always clean my brushes with baby shampoo against my palms and these never shred. They're incredibly soft and the majority of them have natural bristles. To be completely honest, I reach out to these brushes more than any others, which is why I don't even bother to invest in expensive ones. Sólo una nota rápida, las primeras brochas en las que decidí invertir fueron las del set de 22 piezas de Coastal Scents. La calidad es más que excelente y me han durado años. Siempre lavo mis brochas con shampoo de bebé contra mis palmas y estas jamás se han deshecho. Son increíblemente suaves y la mayoría de ellas tienen cerdas naturales. Para ser completamente honesta, uso estas más que cualquier otras, por lo cual no me molesto en invertir en otras más caras. 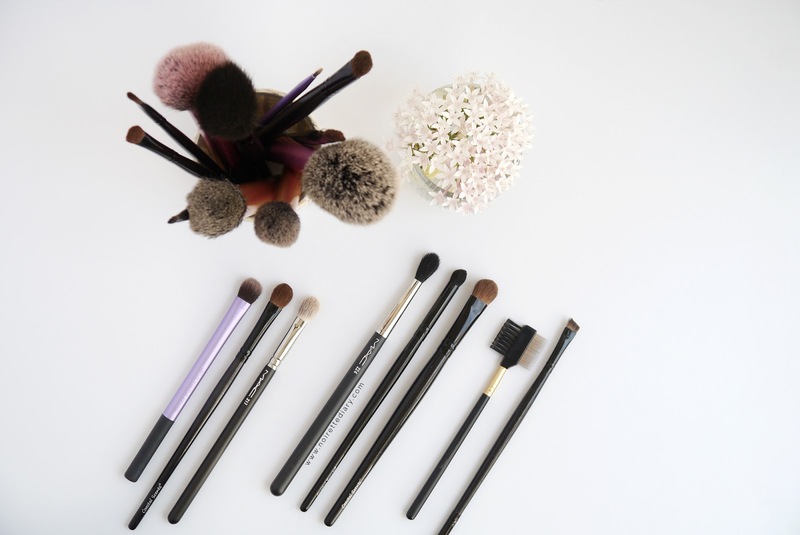 For the eyes I like brushes that can give me a complete look with different eyeshadows. The Real Techniques Domed Shadow Brush is great for packing product into the lids and blend it out as the color fades. For more blending purposes I've been using the MAC 217 brush, specially for the outer edges where I want things to be more smokey. However, my favorite one is the Blender brush from Coastal Scents, a bit less stiff than the 217 but not as loose as the MAC 224, which I like for further crease blending and transition colors. From that same Coastal Scents set, I like to use the Large Shadow brush for matte brow highlight and cleaning the edges with a light eyeshadow. To add color to my bottom eye area, I like to use the Pointed Blender brush for more precision on my smokiness. This same kit has 3 different angled brushes, I prefer the larger one for my brows because I can get them done in seconds. To give them a good brush I use the Femme Couture Brow Brush, I got this one from Sally Beauty Supply but I can't find a link to it. What is great about it is that it has a metal lash separator, unlike most of these are made of plastic. Para los ojos me gusta usar algo que me puede dar un look completo con diferentes sombras. La brocha Real Techniques Domed Shadow Brush es ideal para empacar producto en los párpados y difuminarlo mientras desaparece el color. Para mayor difuminado he estado usando la 217 de MAC, en especial para las orillas externas donde quiero que luzca más ahumado. De todos modos, mi preferida es la Blender brush de Coastal Scents, un poco menos dura que la 217 pero no tan suelta como la 224 de MAC, la cual me gusta usar para un difuminado mayor en la cuenca o para colores de transición. De ese mismo set de Coastal Scents, me gusta usar el Large Shadow brush para un iluminado matte bajo las cejas y para limpiar las orillas con una sombra clara. Para agregar color al área de abajo, uso el Pointed Blender brush para mayor precisión en lo ahumado. Este mismo kit tiene 3 diferentes brochas con ángulo, yo prefiero la más grande para mis cejas porque las puedo tener listas en segundos. Para darles una peinada, uso la brocha de cejas de Femme Couture, esta la compré en Sally Beauty Supply pero no puedo encontrar el enlace en línea. Lo grandioso de esta brocha es que tiene el separador de pestañas de metal, no como otras brochas de este tipo que son de plástico. For my complexion I like to keep it simple with Real Techniques, I use the Buffing Brush if I'm wearing foundation, because I like to apply BB creams with my fingers still. I conceal my bags with my middle finger and buff out the edges with the same brush, then I will do some pin-point concealing with the Fine Liner Brush. To powder my face I like to use the Blush Brush because the tapered end can get right into my under eye area to set the concealer there as well. For blush I always use the Multitask Brush to paint my apples as I smile, and for contour I go for the Angled Brush in the Coastal Scents Kit, it's very soft and easily follows the hollows in my cheeks. Para mi rostro, me gusta mantener todo muy simple con Real Techniques, uso el Buffing Brush si llevaré base, porque aún me gusta aplicar cremas BB con los dedos. Aplico corrector bajo mis ojos con el dedo de en medio y difumino las orillas con esa misma brocha, después hago corrección detallada con el Fine Liner Brush. Para aplicar polvo a todo uso el Blush Brush, su forma punteada entra bien bajo mis ojos para fijar el corrector de ahí también. Con el rubor uso el Multitask Brush para pintar las manzanas mientras sonrío, y para esculpir me voy con el Angled Brush del kit de Coastal Scents, es muy suave y sigue muy fácilmente los huecos de mis mejillas. 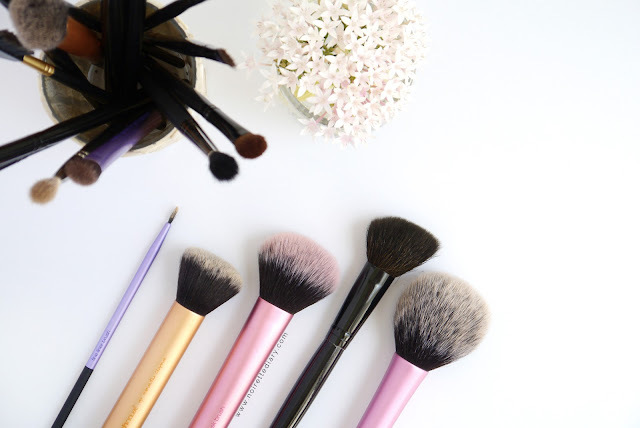 What brushes can't you live without? ¿Cuáles son las brochas sin las que no pueden vivir?